On Saturday, September 15 at 10:00 in the morning the Galway modified cross country team ran the Rosie’s Walk for Diabetes. The Rosie’s Walk is a run/walk held in memory of Rosalie Eaton hosted by the Galway Lions Club. The donations benefited the Galway Public Library, the Juvenile Diabetes Association and the American Diabetes Association. The race raised over $11,000 with the modified cross country team donating about $350. Danielle Gabri and Shawn McDonald collected over $100 each. The race is 3.8 miles starting at the Lions Building going down Rt.145, taking a left on Crane Rd., looping around Parkis Mills, going in front of the school and returning to the Lions building. There was also a longer loop that included Alexander Rd. and Graves Rd. too. The modified cross country team (Clark Anuszewski, Casey Clarke, Carson Eagan, Danielle Gabri, Abigail Gullett, Carmen Imbo, Emma Mariani, Shawn McDonald, Rainn McMillan and Emma Mitchell) ran the shorter loop and got first, second and third overall and first place for the girls and the boys. Rainn McMillan won first overall and first for the boys, Emma Mitchell won second overall and first for the girls, and Casey Clarke won third overall and second for the boys. Coach Decker’s yellow lab Chase ran a strong race for the first two miles and then walked the rest of the race with another dog pal, Ben. The race was lots of fun. Before the race, the team did some stretching and lots of dog petting. During the race there was lots of encouragement from the walkers and our teammates. It was also a good time to connect with friends and push your abilities to become a better runner. 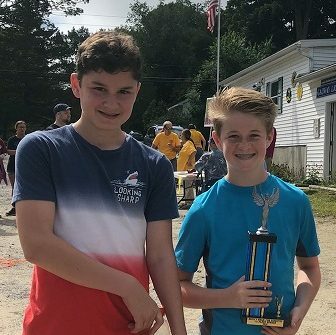 After the race, the walkers and runners enjoyed free burgers and chicken prepared by members of the Galway Lions Club, and the winners received their trophies. Overall it was a great and fun morning.